California’s young men of color continue to face troubling academic disparities and persistent discrimination on their path to and through higher education, finds our new report, Hear My Voice: Strengthening the College Pipeline for Young Men of Color in California. 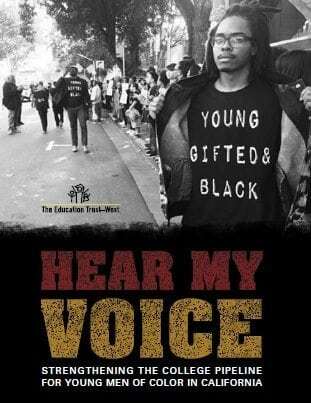 The first Ed Trust–West report examining the intersection of race, gender, and education, Hear My Voice draws upon on-campus interviews with male students of color, parents, educators, and administrators, as well as reviewing existing research. Below you’ll find the report, a short video about Hear My Voice, a researcher Q&A, and a petition urging California’s education leaders to publicly report important race and gender data. The Education Trust–West has also partnered with Educational Results Partnership (ERP) on this work, to learn from and share research findings, policies, and practices that help strengthen access to higher education for California’s young men of color. Based on their longitudinal database on student achievement, ERP has developed the YMOC Data Tool – which allows users to search and identify key academic data at the regional, county, district and school levels. The tool provides in-depth data analysis on Latino, African American, Native American and Pacific Islander males, ages 16-24.